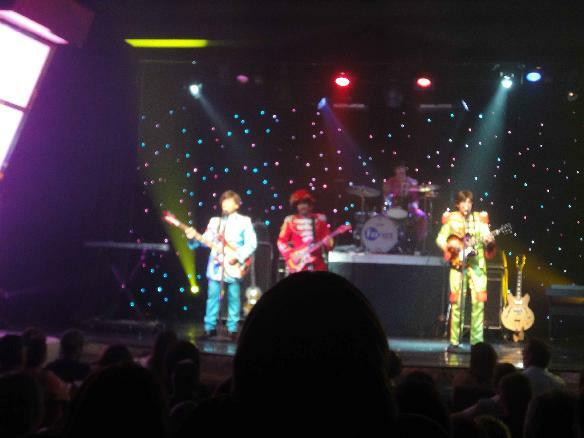 My daughter is really into the Beatles these days and I thought it would be really fun to take her to see as close as you can get these days to seeing them; A Las Vegas show! We had the cheap seats but it was a very small place, maybe 300 people so all the seats were great. They started with a guy who was acting like Ed Sullivan and introducing the Beatles for the first time and they started with all the old tracks from the early 60's like Hard Day's Night, Help, Twist and Shout, Drive my Car, etc. They had some go-go dancers come out as well in the next part when they changed era and Ed was back as well, then we got the Sgt. Pepper's era material. My daughter really wanted to hear Octopus's Garden, which is her favourite Beatles song but we only got A little Help From My Friends as the only Ringo song. The guy who was playing John Lennon did not look that much like John, but he had the voice down perfect. The guy who played Paul, while he had the look, I thought his voice was just not right. Don't get me wrong, he was a very good singer and sang the songs great but he was not a Paul clone. They ended the set with later era material including a piano piece with just John called Imagine from John's post-era Beatles work. It was like a 65 minute show and very professionally done with great costumes, good lights, excellent sound and good performance. My daughter really liked it a lot and was singing.